As we like to do at the start of each new month of the year we are going to take a look through what the month of March has in store for you if you are an online casino game player or have an interest in the online gaming environment. As usual there are new slot and casino games being launched through the month of March, and with some interesting and novel offers, bonuses, promotions and slot tournaments you are always going to be assured of finding plenty of ways to enhance your online gaming experience by doing a little shopping around! 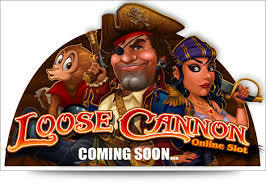 We are of course going to be seeing a range of new slot games going live this month, and Microgaming have already announced plans to add another Untamed Slot game to their range of multi line, bonus video slots along with a standalone slot which goes by the name of the Loose Cannon slot which is a Pirate theme slot. Both of these new Microgaming slots come with the now standard 243 ways to win playing format which it does appear online slot players are enjoying playing more than the standard payline structured slot games. Microgaming did announce last year that they intend to roll out a constant stream of their back catalogue of online bonus video slot games and make them available on their HMTL5 mobile web compatible mobile casino platform and true to their word they will be releasing both the Mayan Princess and Tigers Eye slot games during March onto their mobile casino platform. Another casino software designer who has a range of new and enhanced high definition slot games is Probability, and they have also being increasing their range of mobile slots and also tweaking some of their existing range of slots to give them much better graphics and making them fully compatible with all types of mobile devices. In fact Probability have been subject to a buyout recently and as such will soon become under the full control of a company called Gtech UK Interactive Limited and as such we expect to see a new range of mobile games to become live in the recent months once the new owners make their mark on the company! Will Ladbrokes Cease their Betting Shop Expansion? One of the largest betting shop operators in the UK is Ladbrokes, and they do appear to be having something of a bad time recently with turnover and profits being noticeably down. Word has it that they may be about to reign in their land based betting shop expansion and concentrate their efforts on the online gaming environment instead. Having recently announced they are going to be moving their gaming platforms from Microgaming to Playtech they are probably hoping this will have the same effect it did when William Hill joined forces with Playtech a number of years ago, with the William Hill and Playtech link up helping to massively increase the turnover and profitability of the William Hill organisations online gaming arm of the company. Will Florida Legalize Online Gaming? It does appear that as each month goes by we hear of another US State that is looking into the possibility of legalizing online gaming, and this month it would appear to be the turn of Florida! Law makers and the powers that be in Florida are looking into the feasibility and benefits of opening up their State Boundaries to online gaming, however this is just an investigative look into the benefits of online gambling and by no way it is a done deal! Whilst the US State of Delaware, Nevada and New Jersey are now reaping the benefits of legal online gambling it remains to be seen which US State will be the next to join those three very forward thinking States! One of the UK’s most established land based gaming groups that being the Gala Coral Group who own and operate licensed casinos and betting shops all over Great Britain has seen their online operations massively increasing in turnover this past year with much better results than they had expected. Thanks to some in-house cross marketing campaigns aimed at turning their loyal land based gaming venue visitors into online gamers they have seen users of both their online casino sites and their range of Coral themed sports betting sites grow in number. It is probably down to their vast experience in knowing exactly what their customer want which includes early prices and guaranteed odds on their sports betting markets and generous ongoing promotions at their online casino site that has enabled them to keep one step ahead of the competition, and it will be interesting to see if they can continue with this upward growth in customers and gambling turnover. We have seen quite a number of online casino and online poker site operators pulling the plug on customers based in Spain in the last few months, and another site that being Poker770 have announced that they are also no longer offering their online poker site to anyone living or residing in Spain. Having started to license and regulate any online gambling sites offering services to their citizens, Spain has sadly put into place some very high taxation and licensing fees which has resulted in gaming site operators finding it is more cost effective to leave the Spanish online gambling market place than it is to keep them open and as such there are now only a handful of poker and casino sites that still readily accept Spanish players! If you do happen to be one of the players living in Spain who hold an account with Poker770 and you have funds in your account then you do need to log in and withdraw them as soon as is possible to ensure your account balance will not become voided or expire.